Garden of Aaron: Are Hellbenders actually Canaries? Take a good look at this Hellbender. You might not get a chance to see one for real in the wild. I read a couple of disturbing stories last Friday about the disappearance of the Hellbender, North America's largest salamander, whose populations are crashing in the wild. What's causing the Hellbender decline? Scientists don't know for sure, but a likely culprit seems to be declining water quality. Since salamanders breathe through their skin and live in creeks and streams, they could be the canary in the coal mine indicating problems with our water supply. 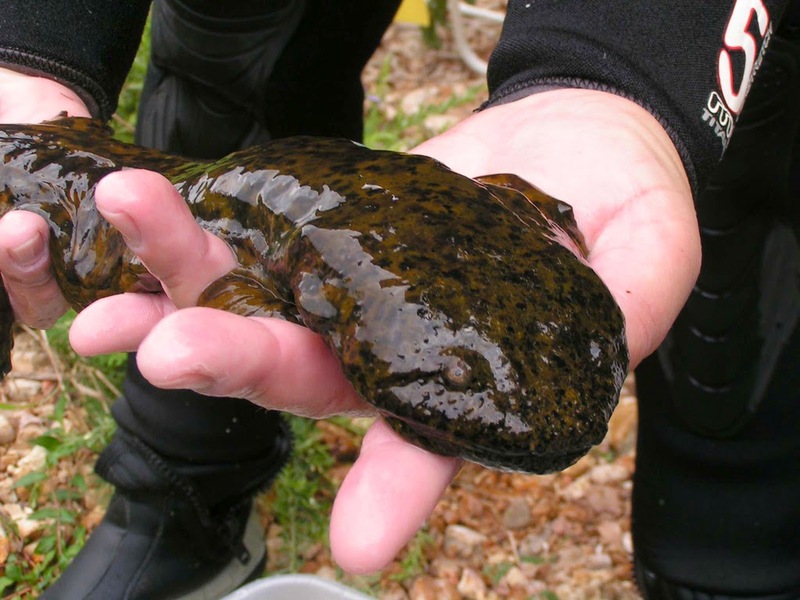 So how can we help save the Hellbender? The Christian Science Monitor says "Researchers are urging landowners to plant trees and grasses along rivers to improve the water quality." So that does mean you're off the hook if you don't live alongside a body of water? I doubt it. One way or another, much of the water that runs off our lawns and hardscapes during a storm probably ends up in a river, creek, stream, lake or ocean (unless it goes directly into a water treatment facility). If all or most of the land on your property consists of short lawn and hard spaces that can't absorb water, you're going to have a lot of untreated runoff. If you spray herbicides (weed killers) or pesticides or fertilizers on your lawn, some portion of those treatments may wash off in a heavy rain and make their way into bodies of water. So how can homeowners help? Together, perhaps we can save the Hellbender. And ultimately, if the water is cleaner, we'll help ourselves too.